Life can be hard, and it can be very easy to focus on everything that goes wrong. Sometimes it is a choice to be positive and to focus on the blessings we have. Practicing gratitude is an everyday decision to focus on the little things, and not take them for granted. Gratitude is “the quality or feeling of being grateful or thankful”. It’s reminding ourselves that despite everything that may be going wrong, there are many things going right. Gratitude has many health benefits, including providing help for Depression and Anxiety. When you focus on the positive and being grateful, your brain produces feel-good hormones like dopamine and serotonin. Practicing gratitude also teaches you to reframe negative thoughts into positive ones. This can also help combat symptoms of Depression, Anxiety, and other mental illnesses. Gratitude can also help improve your physical health. According to Positive Psychology Program, those that practice gratitude report less physical pain, and sleep better. Gratitude can also improve your resiliency, increase empathy towards others, and make you a better friend to others. 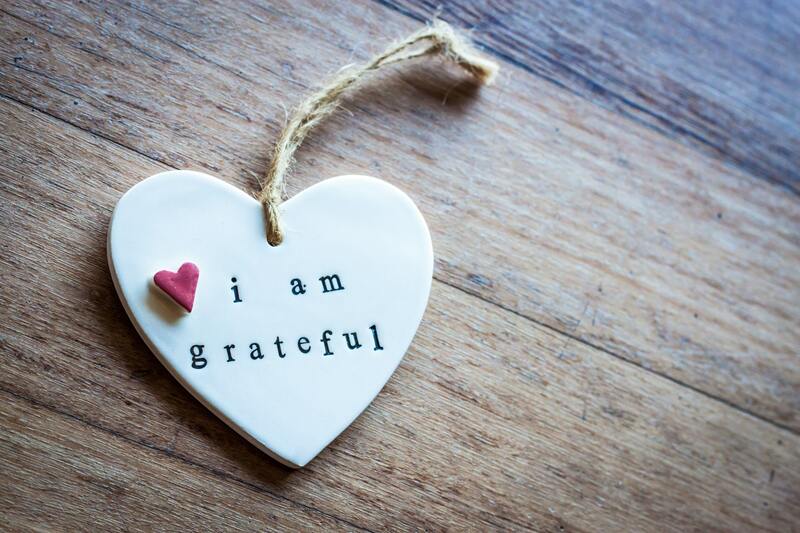 Today I’m going to give you 15 simple ways to practice gratitude. My hope is that this list will jumpstart you on a path to healthier living and a life full of gratitude. A gratitude journal is a journal dedicated to gratefulness. Every day you journal about three things that happened during your day that you were grateful for. Sometimes it can be as simple as no traffic on your way to work, or a big presentation that went off without a hitch. Other times you may journal about your spouse, your children, your parents, etc. Sometimes it may be really easy to come up with three things, and other days may be harder. Telling other people “thank you” may seem like common sense, but it actually takes a lot of intentionality. Make sure you that are thanking people who do the little things that make your life easier. Thank the janitor at work, thank the police officer who keeps you safe. Say thank you to a co-worker who makes work bearable. Have you ever performed an act of kindness “just because”? There is definitely a high that comes from doing something nice for someone for no reason at all. Pay for someone’s order at a drive-thru, leave a note on a parked car, or a surprise on a co-worker’s desk. Buy a meal for the homeless person. Do things that make the world a better place. When you volunteer for a cause that you believe in, it definitely makes you feel grateful. If you don’t currently volunteer, think about what causes you love and want to support. Find out ways you can help, either by giving your time, fundraising, etc. When negative thoughts enter your mind, find a way to look at them through a different lens. For example, when it rains outside, instead of focusing on what you may be missing out on, focus on the fact that your garden is getting some much-needed water. This may seem simple, but finding ways to reframe can definitely combat Depression and Anxiety symptoms. Pay attention to the people around you who make your life easier. Too often, they go unnoticed. Make sure to be kind to the waiter/waitress and busser at a restaurant. Show gratitude to your secretary who takes care of so many little things for you. Pay closer attention to your spouse. Telling others that you love them is an important way to show gratitude. It lets them know that you see them, appreciate them, and adore them. Find some inspiring quotes and post them in visible places in your home and workplace. Try to remember that there are so many good things about life. Post positive quotes on your social media. You never know whose day you may brighten. Get outdoors and spend time in nature. Look at the beauty that is around you, and remember the One who created it all. Unplug from all the stressors of life and focus on the simplicity of being in the woods or by the water. Breathe in the fresh air. Spend quality time with those around you. You will never regret giving your time to those you love. Sit on the floor and play with your little ones, or read them a story. Spend time with your parents and grandparents. You never know how much time you will have with them. Give friends the gift of time when they are going through a difficult period. When someone does something well, make sure you are complimenting them. Whether it’s your kids, your spouse, a co-worker, neighbor, etc. People appreciate and thrive off of words of affirmation. We all have days that are terrible and no-good, very bad days. It’s easy to want to complain to everyone about how bad we have it. I would challenge you to fight the urge to complain or play the “poor me” card, but instead to remember that the whole day was not bad. Write a letter to someone who positively impacted your life. This can be a mentor, parent, grandparent, teacher, past boss, etc. Let them know what they did that was so powerful. Thank them for their influence. Leave a Post-It note on someone’s desk, send an email, or a card in the mail. Get a jar and some small strips of paper. Every time you are grateful for something, write it down and put the date on it. When you are having a bad day, open the jar up and read through the things you’ve written down. I will remind you that there is always something to be grateful for, even on the worst of days. Take time to thank God for the blessings you have. Have some quiet time during your day to just pause and breathe. Remember to thank Him for the prayers that have been answered, and for the struggles you continue to have. Pray for before your meals, pray before bedtime, and pray with your kids. What other ways do you show gratitude? What would you add to this list? *Christy Fogg, MSW, LCSW is a licensed therapist at Journey to Joy Counseling in Carmel, Indiana. Christy enjoys doing marriage/couples counseling, individual counseling, premarital counseling. She also provides family counseling, teen and adolescent counseling.